Not sure if it's a Lynx 1 or 2 replacement, but he's expecting the cost to be 1/2 the price of the McWill screen. Edited by LynxHandyCaster, Tue Feb 5, 2019 10:03 AM. I'm highly interested in his "drop in" GBC LCD that is coming quite soon. Obv I've already had the other systems modded so have no need to do those again. 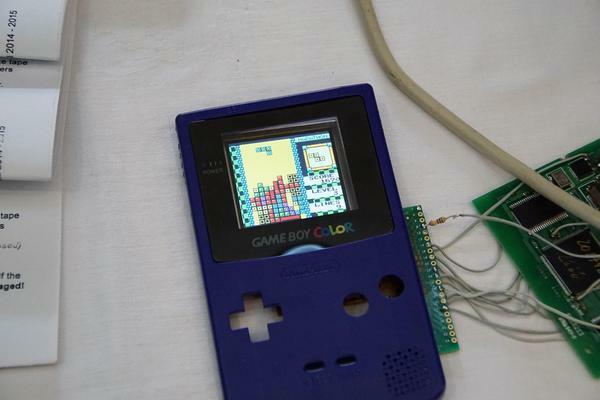 BTW my production for the GBC mod kit is already running. I presented the prototype in November 2018 on the Ejagfest in Germany. The final version has 32K colors and would be almost plug and play. Just 1 wire has to be soldered. You also can install a VGA connector, if you want. The case can be closed with the existing screws. Edited by McWill, Tue Feb 5, 2019 4:10 PM. Looking forward to this one very much! Maybe the VA4 Game Gear will be supported! But, probably not.... oh well, a man can dream! @McWill what do you think the retail price will be on the GBC kit? Similar to the Lynx and GG kits? Although I do not think the market is big enough for two. There is definitely room for two on the market. McWill's version will have VGA output still, but will cost more and Benn's version will be the cheap LCD only option. Plus a bit of competition is always good! I wonder is it would be possible to support the HBL palette chages. There is some games that use hi-colour stills and they don't work well on McWill screens. Do not get me wrong. I'm happy about competition. But I also believe that the actual market for Atari Lynx LCD games is very small. I'm looking forward to the first tests. He also mentioned it's for the Lynx 2, since he doesn't have a Lynx 1 to test it on. I don't know much about the McWill screen, is it physically different because of the way it connects to the frame (lynx 2) or motherboard (Lynx 1), or is it also electronically (computerically.. lol) different? He posted a video on Facebook on the NSDL screen for the GBA: https://www.facebook.com/BennVennElectronics/videos/408958746582179/ Looks like the Lynx and GC are coming up too. Exciting times for all. I'm interested, I have always been wanting to upgrade to an LCD on my Lynx and Game Gear. Just have always passed in the past due to the cost as it's pretty random as to when I want to play one of my old handhelds. Interested to know more about this when it becomes available. Are there still any plans for a Nomad screen replacement? Hi! I'm new around here but would like to take a minute to say hello! I have quite a few new LCD kits coming out in the following weeks including the Lynx, GameGear, GBC, GBA, SP, NeoGeoPC, DMG, pocket and nomad. Hopefully I can contribute something to this modding scene at a competitive price. Hej Benn, welcome here, and nice to see you actually have a working prototype ! Do you have any idea already about the release date ? And what price range do you think you will be able offer your kit ? My lynx lcd kit will be usd$50, or $40 if you want to buy your own LCD. I should have the proto finished in a week and shipped off to atarigamer for testing the various videos modes. If all goes well I'll have a production run in store in around 6weeks. The first production batch of my GBC kits will arrive in 3 days and are $70. This will drop to $50 in future batches. The other systems will be priced very similarly. Hi benn and welcome ! What type of screen will works with your mod? In particular i like you're point of view regards to lower the future prices.